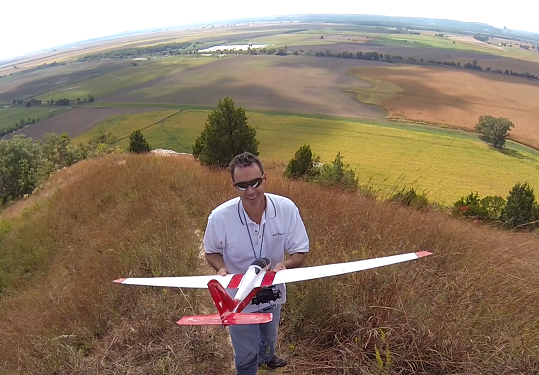 Remote-control sailplane contests bring people together for an entirely different day of fun. Contest flying helps hone thermaling techniques and precision landings are measured by the inch. Learn more about MVSA contests and see the current MVSA standings on our Contests page. Of course, flying with your MVSA clubmates is about much more than contesting. For every contest session, there are several fun-fly days. A pleasant day, whether it's summer, fall, winter or spring will find a number of MVSA members at the field with a winch, enjoying the lift and the camaraderie. Some of our members are students; others are retired; others work variable schedules. This means that the lure of a beautiful flying day can usually pull at least a handful of stalwarts out to test the air. On particularly sweet days, guys have been known to grab a day of vacation to get out to the sod farm. Fun-flying is fun, of course, but it's more than that. It's a time to tweak and fine-tune your plane's trim, practice your launch technique, or maybe shoot for an LSF task. A number of our members are working on the LSF achievement program, and we even have an LSF-relations officer, Mark Miller, who can assist new or experienced aspirants as they climb the ladder. Fun-flying is also a chance to learn. Whether it's thermaling tips from Nelson, HL info from Chris, or building tips from Art and Glauco, there's no better time to tap into the reservoir of knowledge in the MVSA membership. What’s the fastest a model plane has flown? About 505 mph!! Click here for video – a record set by an unpowered sailplane! Sailplanes have flown over 100 miles cross-country, have stayed up for 12 hours plus, have flown to 7000’ altitude. 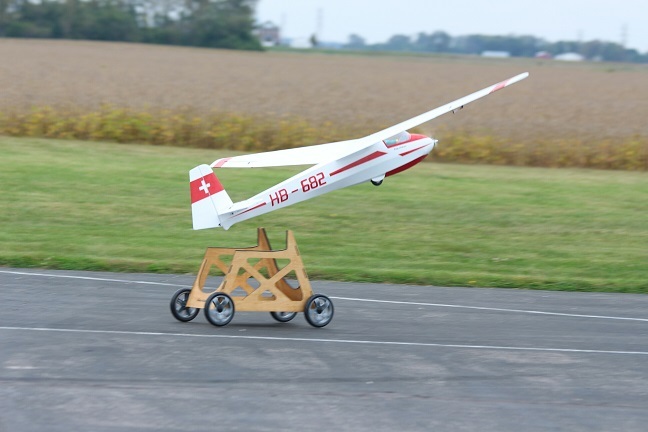 You don’t need a glow engine, an electric motor, or a jet turbine to do amazing things with a model plane. The beauty of doing something amazing with an unpowered plane is that the pilot gets all the credit! Our planes are highly engineered. Their wings are long and skinny, but they can take a pull of 150 pounds or more on the towline during the launch. To withstand the stresses, meticulously-designed carbon spars and stressed wing skins are used. On the top competition planes, the wing’s airfoil contour is controlled to within 1/100th of an inch, across 140 inches of span. A 12-foot plane may weigh as little as 4½ pounds, yet when conditions are windy it may carry ballast that brings its total weight up to 9 pounds. Despite the plane’s long wings and slow-motion maneuvers, it’s possible to land one so that the nose hits a spot no bigger than a dinner plate. This is made possible by skillful piloting, of course, but the pilot is aided by a sophisticated control set-up that provides strong air-braking, in conjunction with yaw, pitch and roll control. 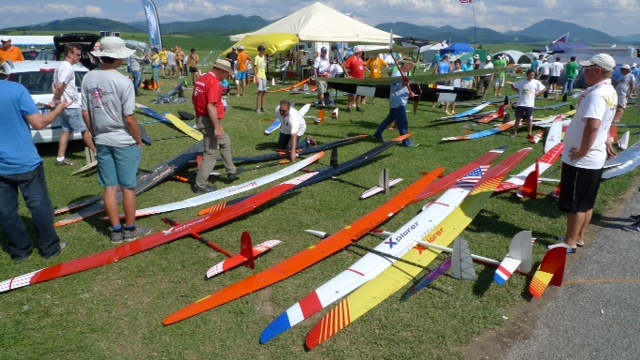 Remote-control sailplanes range widely in price to suit most everyone’s needs. A basic kit can run little more than a hundred dollars while a Ready To Fly top-end molded ship can top out over $2000. directly related to performance: the plane’s, and his own. Why? Because the longer you stay up, the more fun you have; and staying up requires a good plane and good piloting. As soon as the plane leaves the launch, it starts to descend, since it has no motor. But if it is a high-performance ship, it will cover a lot of territory as it glides toward earth, and a skillful pilot will use that searching capability to find places where the air is rising, due to thermal currents or other causes. With practice, he can take advantage of that rising air to gain altitude and prolong the flight, sometimes for a very long time. It’s the constant quest for more and more performance that makes sailplane flying so exciting and so addictive. No matter how good you or your plane are, you always land; and you always think that maybe you could have done even more. The mainstay of sailplane flying on flat land like the terrain out here on the prairies is thermal flight. This involves finding columns of air that are rising because of temperature differences. Local heating can cause one part of a field to get warmer than the adjacent ground. This in turn can heat the air above, and a bubble of heated air can get lighter than its surroundings, break off, and begin to rise. This process includes a lot of randomness and mystery, which greatly adds to the appeal of trying to find and use thermals to lift your sailplane. MVSA Email Listserv MVSA has a Google e-mail group for members of MVSA. The e-mail group is used to communicate club info, organize impromptu fun flies, sell stuff, ask questions and anything you feel like telling the group. It is a private group so you must be registered to receive or send e-mails to the group. This is a great resource for new members. If you are unfamiliar with e-mail groups or have questions let me know. Please e-mail the moderator for an invitation or info. Anyone interested in joining our club is welcome to join us at the field to see what we do. Please contact one of the officers below for more information. The MVSA Club Field is only open to members of MVSA. No power flying will be allowed except for electric powered sailplanes. Club meetings are typically held the first Tuesday of the month at the Bridgeton Trails Branch library from October - March. 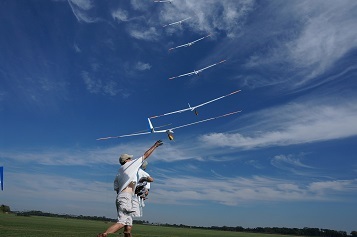 From May - September meetings are typically postponed in favor of impromptu fun flying at the club field. (with any necessary business being conducted by email.) Please check the front page for monthly details as the library dates can vary due to availablity. Club field meeting starting time: 6:00 P.M. The first time you circle your plane in a thermal, and you ride it up until you can hardly see it, you will be hooked for life. The grandeur of flying sailplanes is the challenge of every flight due to the constantly changing conditions. MVSA is a great club and has been around since the mid 70’s. When I joined around 1977-78 the club was flying at Koch Park in Florissant. I happened to be swimming at the pool one day and saw an Olympic Sailplane with transparent red wings gliding over the corner of the pool. It really grabbed my attention as it didn’t have an engine and the plane was circling in a thermal and kept going up. My father flew RC engine planes so I was very familiar with them. After riding my bike down the hill to the field, I met Dan McIntee and current club President of the time, Charlie Watts, and they suggested I join the club. It was a great decision as we had many helpful members then as we do now. 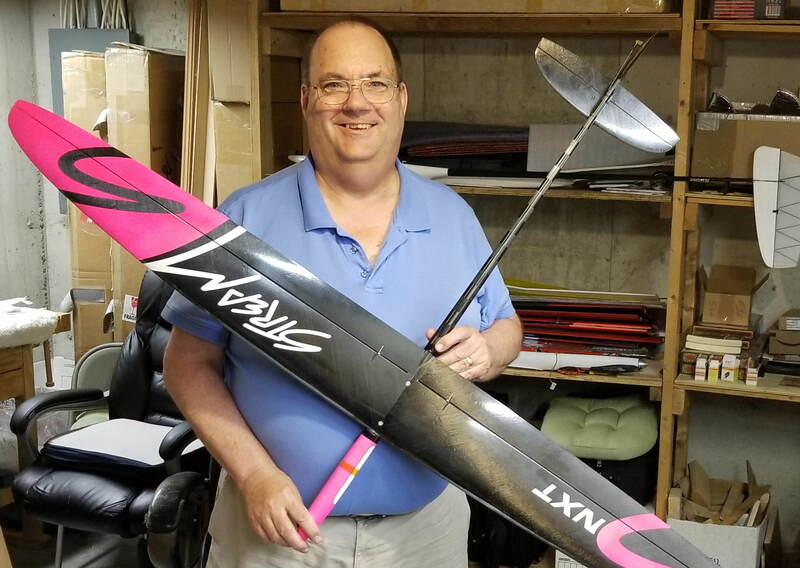 If you are interested in learning about flying sailplanes and joining a great group of folks, our club is a great one to join. If you are just beginning, or enjoy competition you will have a lot of fun! Anyone interested in sailplanes are encouraged to contact any of us here and join us for a day of flying at our beautiful flying site. I look forward to seeing everyone at the field.